6 bi-monthly issues available on your computer or tablet. Instant access to our pattern library! That’s up to 600+ premium patterns for FREE! *Receive a one-year subscription for only $2.91 per month, which is billed once at the time of purchase for a one-time payment of $34.97. *With your one-year subscription to I Like Knitting Magazine, you will receive a FREE printable adult coloring book. This offer is only available until February 4, 2018. Your free coloring book will be delivered via email within one week of purchase. *With your one-year subscription to I Like Knitting Magazine, you will receive a FREE mystery gift. This offer has limited quantities and is only available until March 31, 2018 for orders in the U.S. and Canada. Your free mystery gift will be mailed to you within one month of purchase. Take I Like Knitting on your iPad/Android tablet wherever you go, and also enjoy website access for printing out projects and watching tutorials on your computer screen. For a limited time only, become a member of I Like Knitting for just $19.97. That's 43% OFF! You'll receive full access to patterns, videos, and trendy articles on your computer and tablet. 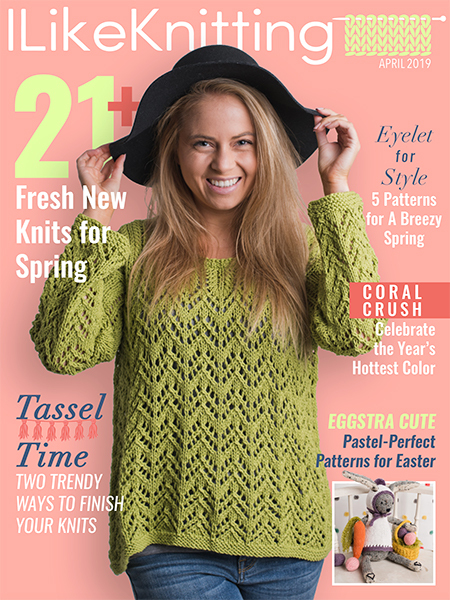 Save $15 today when you subscribe to our premium knitting community. From scarves and cowls to shawls and afghans, I Like Knitting Magazine is the only knitting resource you'll ever need! Enjoy I Like Knitting's projects and tutorials on your laptop or desktop computer. Plus, receive access to our site's magazine archives and uncover additional projects and tutorials. Read I Like Knitting on your iPad or Android tablet! Continuous Service Guarantee: Your subscription will continue until canceled, and your credit card will be charged under the terms selected above. If you are dissatisfied with your subscription, at any time, for any reason, you may cancel without further obligation, no questions asked.